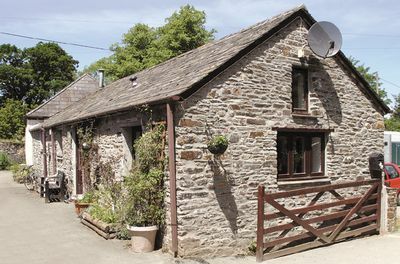 St Leonards - Demelza is a two bedroom stone barn conversion which sleeps 4 people. It is situated in the village of Polson near Launceston in Cornwall. It nestles in the Tamar Valley and is close to the Devon border. It is one of 4 holiday properties set within an equestrian centre and is therefore ideal for horse lovers. Riding lessons from beginners to advanced are available on site, as well as show jumping and a cross country course. The cottage is well equipped and comfortably furnished. There is plenty of entertainment including digital TV, DVD player, video player, Playstation2 along with a selection of films/games. And the owner also hires out a Playstation3 on request. The sleeping arrangements include a double room and a bunk bed room. The owner allows pets, up to one dog maximum.